Please visit our VirginMoneyGiving page. Donating is simple, fast and totally secure. It's also efficient from our point of view - somebody else collects the money for us and makes sure that an extra 28% in Gift Aid is added to your donation, at no cost to you, if you are a UK taxpayer. Virgin charges a 2% transaction fee and a 1.45% card processing fee so if you're a UK tax-payer, a £10 donation ends up delivering £12.15 to Ellie's Haven (click for more detail). Please visit our JustGiving page, where you can make a single donation or set up a monthly Direct Debit. JustGiving is similar to Virgin but charges slightly more - a 5% transaction fee and a 1.3% card processing fee. 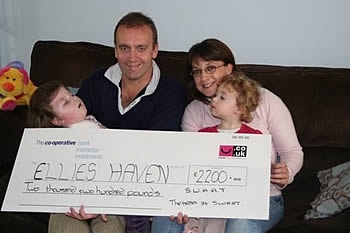 So if you're a UK tax-payer, a £10 donation ends up delivering £11.74 to Ellie's Haven. Donations can also be made by cheque, payable to Ellie's Haven Cornwall Ltd., and posted to Ellie's Haven, Duloe, Liskeard, Cornwall PL14 4PW. If you are sending a cheque and you are a UK taxpayer, please download and complete this Gift Aid Declaration form (pdf 157KB) and send it with your donation. If you wish to make a monthly donation without going online to Virgin or JustGiving, please download and complete this Standing Order form (pdf 1155KB) and send it to us (together with a completed Gift Aid Declaration form (pdf 822KB) if you are a UK taxpayer). We have received some terrific support from individuals taking on challenges to raise funds for Ellie's Haven. These include sponsored parachute jumps, sponsored bike rides, walks, marathons, triathlons and even a sponsored chest wax!